The morning of September 6 broke hard, clear, and cold as we headed north from Colorado Springs on the final leg of our trip to Wyoming. Pikes Peak was dusted in snow from a brief encounter with winter, a prelude of things to come. At Fort Collins, we were at 5,000′ elevation but our ascent would continue as we headed north. As I learned from John McPhee’s Rising from the Plains, southeast Wyoming is a tipping point of geological wonder, higher in elevation than the plains of Colorado to the immediate south and higher than the northern part of Wyoming. 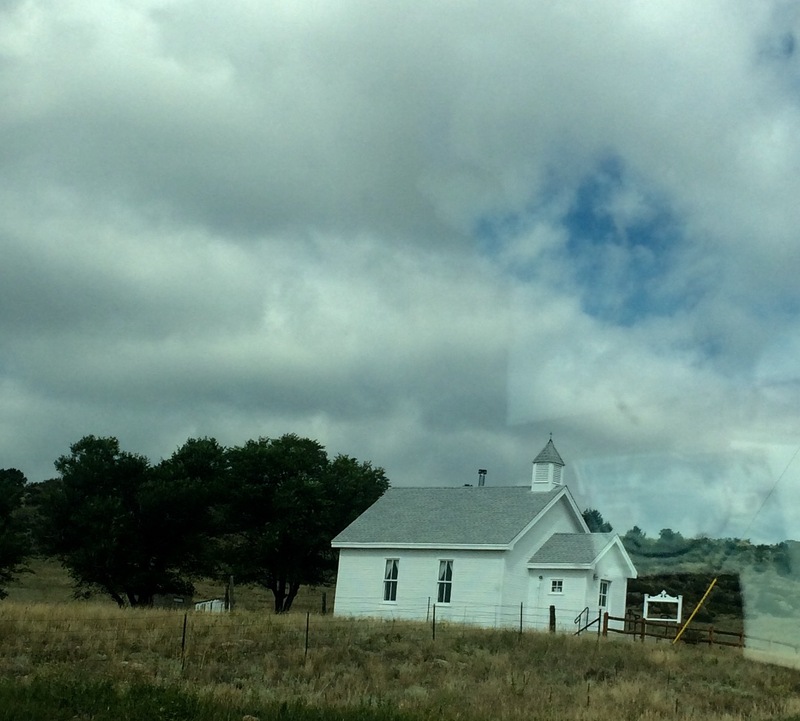 The story of this little church in the Roosevelt National Forest remains a mystery. We ascended the elevation ladder through the wide open land of Colorado’s Roosevelt National Forest on Highway 287, and crossed the Wyoming border at 11:30, ecstatic with the possibilities that lay ahead. 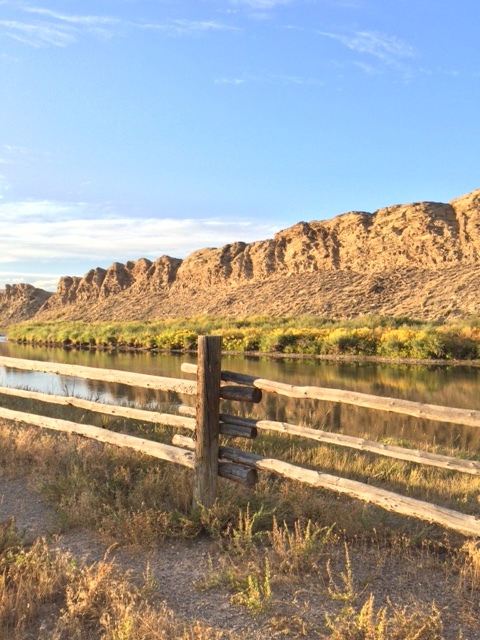 Our plan was to camp one night on BLM land along the North Platte River in a town called Sinclair, just east of Rawlins, Wyoming, elevation 6,800 feet. The North Platte is a river whose journey seems as peripatetic as our own. It starts in Colorado in the mountains, then flows north for 200 miles, also on its way to Wyoming. At Casper, it takes a lazy turn southeast and then goes downhill another 350 miles into Nebraska where it joins up with its sister, the South Platte, to form the Platte River before emptying itself into the Missouri, at which point its waters become indistinguishable from the Mississippi before reaching the the Gulf of Mexico. Dugway Campground in Sinclair, Wyoming. 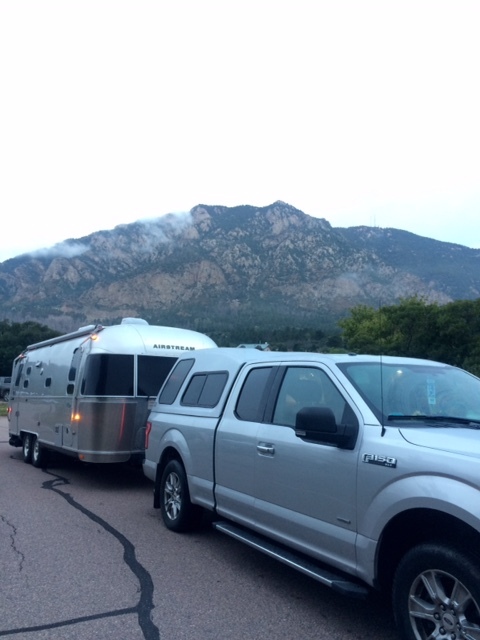 Thanks to campendium.com for helping us locate the Dugway Campground. With only five sites and all dry camping, this place is remote and glorious. We picked the site that backed up to the river. Within an hour, the sun was at work charging both our solar panels and our souls. It was breathtakingly gorgeous. After three consecutive nights of long drives and camping-and-moving, we wanted to rest and decided to stay four nights and get completely refreshed before heading to Jackson Hole. The North Platte River in our backyard at Dugway. Beautiful. 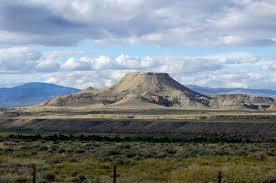 Crowheart Butte in the Wind River Indian Reservation. The drive north took us first through Lander, home of NOLS, (National Outdoor Leadship School), where my son spent a couple of summers during his high school years learning about the wilderness, backpacking, horses, and himself. The road north through the Wind River Mountains took us through the Wind River Reservation and past Crowheart Butte, the legend of which survives to this day in a couple of versions and concerns a battle between rival First Nation People, the Shoshoni and the Crow. This reminds me of one of our favorite large oil paintings by Geoff Parker of Heart Mountain in Cody, which we released when taking to the road. Wherever that painting lives today, may it be the source of great wonder and peace for its owners. Here they are, the Cathedral Range of the Grand Tetons. Any question why we have returned? We crossed over the Togwotee Pass west of Dubois, and even through the thin veil of smoke from forest fires, there were the Tetons. I think I burst into tears, I don’t recall, but the gratitude welled up in my heart. What a gift to be able to return to this valley every year since 1986 when my son and I ventured out here alone, for the first time, greenhorns from back east, and fell head-over-heels in love with these mountains. When Peter first came in 1988, the contagion continued. 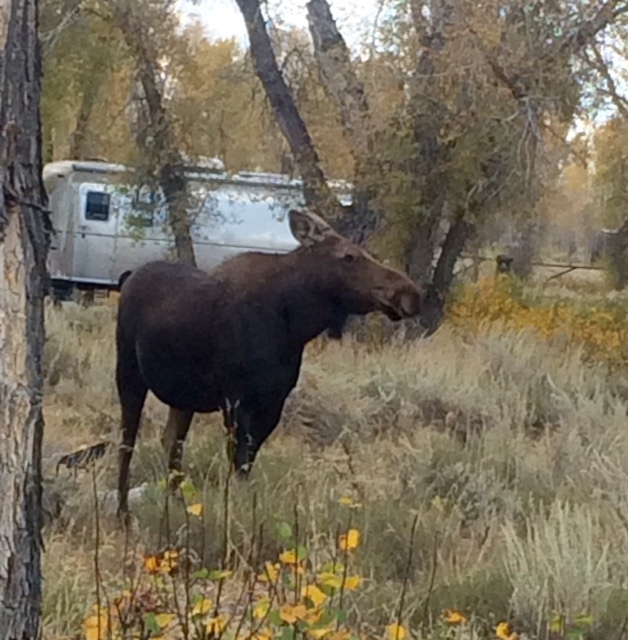 The young moose loved visiting the Airstream-filled campground. 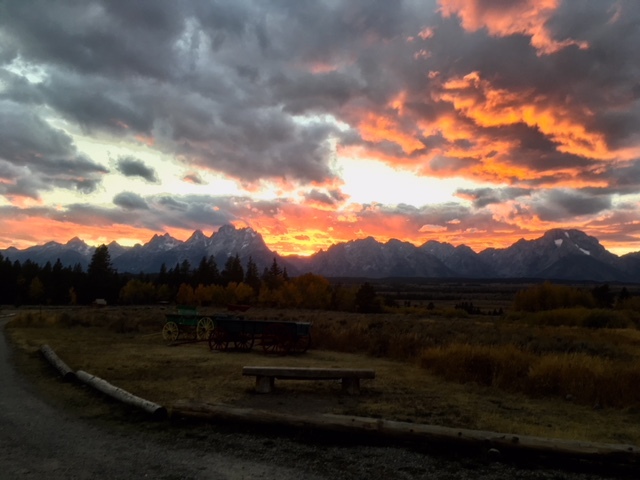 Our first destination was Gros Ventre Campground, a jewel of a place in the Grand Teton National Park. No reservations here and it used to be that after Labor Day, there were enough open sites that one could snag one of the few electric-only sites. Caution: the old calendar no longer holds. The place was very full by the time we arrived at 1:30 on Monday. We were able to get a dry site for one night, at $15 completely affordable. The drill is to get to the office in the morning when they open at 8:00 and put your name on a list for sites being vacated by the lucky few who had electricity, priced at $38 with the Senior Discount Pass. Since we were planning on being there for 11 nights, we wanted the security of heat knowing that at 6,200′ elevation, things can get cold pretty fast. Pig supervises the neighborhood at our campsite in Gros Ventre. There are two things I want to mention about Gros Ventre and the change we have seen in just the four years we have been camping here. First, it’s so popular that when Peter got to the office at 7:15 on Tuesday morning to sign up for electric, there were already 5 people ahead of him (we did snag one, thankfully). Second, this is a haven for Airstreamers. 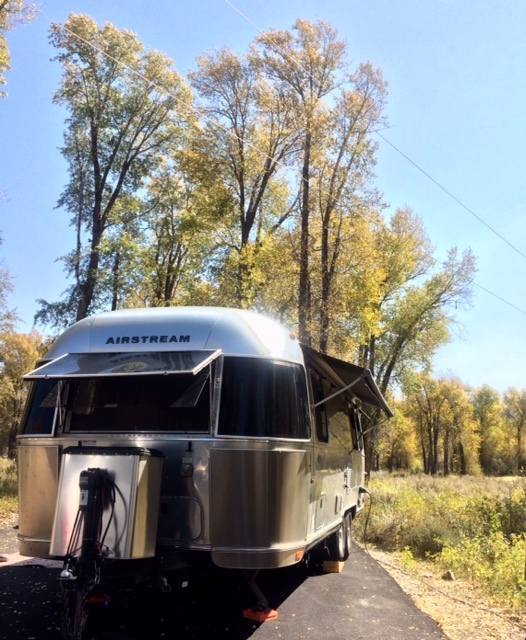 Categorically, we see more Airstreams here than anywhere else in the U.S. at any given time. During our 11 day-stay the daily occupancy ranged from a low of 8 to a high of 25 at this one campground. Loved our site at Gros Ventre overlooking the meadow and the cottonwoods leading to the river. I think a great deal of the credit for Airstream popularity goes to a couple of full timers, Sean and Kristy, whose iconic website, longlonghoneymoon.com. 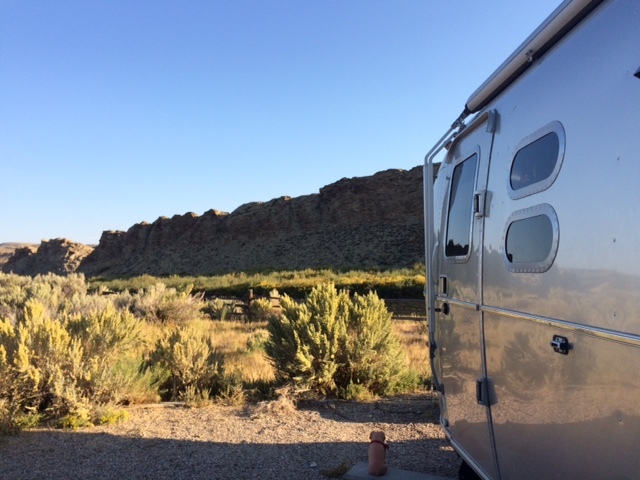 has become a fabulous resource for us and fellow Airstream travelers. Gros Ventre is one of their favorite places to camp in the country. We have crossed paths with them here a couple of years ago, and last year in Orlando, Florida. Sorry to miss them this year, they aren’t arriving in Wyoming until early October. Be sure to check them out. We took a long and gorgeous Sunday afternoon drive up to Yellowstone and visited the Middle Geyer Basin, new to us and jewel-like on this cool afternoon when we felt like a couple of regulars in the valley with an idle afternoon to fill. We scheduled appointments with Chrissy, our massage therapist in Jackson who is the sister of a friend in Keene, NH. Here we are in her studio. It was easy to settle in to Gros Ventre. This year we got to ride the bike trail in the park (awesome! ), visit friends in Jackson, and settle in like long-time residents. One of the best libraries in the country is here (tclib.org) with study rooms that can be reserved online, great for a graduate student with papers to write. There is a new laundromat in town on West Broadway, (jacksonlaundromat.com) which gives our previous favorite, The Missing Sock, a run for its patronage. Another day, we treated each other to massages. Jackson continues to grow. In 1990, the census was about 4,500 and now it’s burgeoned to 9,600 with little indication of stopping. The Dairy Queen has managed to survive at its location on the north side of town along Cache Creek, but many of the early retail places have been crowded out by the increasing gentrification of the town. Motels and hotels were mostly full and the summer rate for the Motel 6 is listed as $240 per night in July. Really. Dornan’s still has the most impressive wine store in the valley and their pub, offering great pizza and draft beer, overlooks the Grand and it’s unbeatable when meeting up with friends. Harvest Moon setting just on the Grand, a first ever event in 33 years here at the Triangle X. From Gros Ventre we journeyed to our beloved Triangle X Ranch for an abbreviated four night stay. We park T2 in the float lot and move into a cabin with endless hot water showers, fresh towels and sheets, and three meals a day, prepared by someone else’s loving hands. In the company of long-time fellow guests/friends, this place is my touchstone and yet, it is ever-changing. 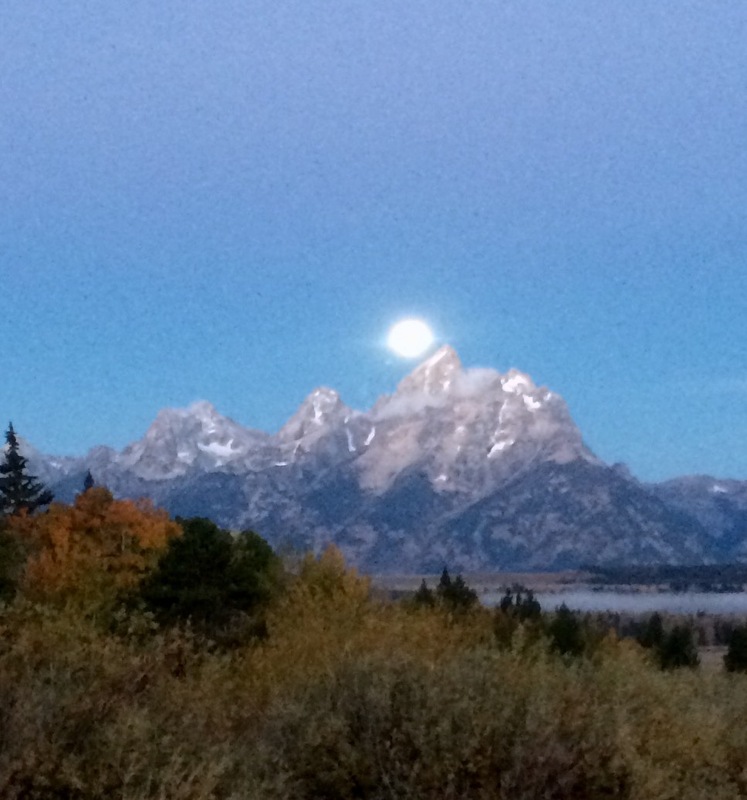 This year, for the first time ever, I watched the Harvest Moon set shortly before sunrise directly behind the peak of the Grand. We shared a two hour hike down toward the Snake River with old friends, marveling in the warm sunshine surrounded by the indescribable radiance of the lush grasses now turned gold, remembering one ride years ago where we followed a red fox trotting along this trail. Happy birthday sky for Kathleen and Fred and thank you to JB for taking this picture and sharing. 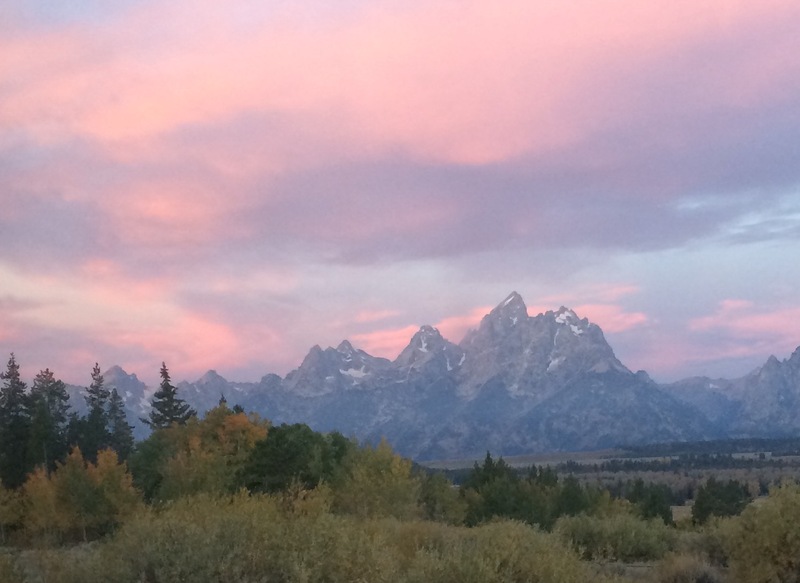 We celebrated the twin birthdays of friends, enjoying pre-dinner cocktails, comfortable in clean jeans and comfy sweaters as the Tetons turned red-gold, in honor of the birthday people. And then, we were gone. We spent our last night in Wyoming in Douglas at a county park of stunning beauty and crossed out of Wyoming on September 26 at 11:30, exactly 20 days from our entry time and with a sigh, entering Nebraska on our slow road, winding our way to Florida, back along the North Platte River. Here I am taking T2 through Riverton, WY. 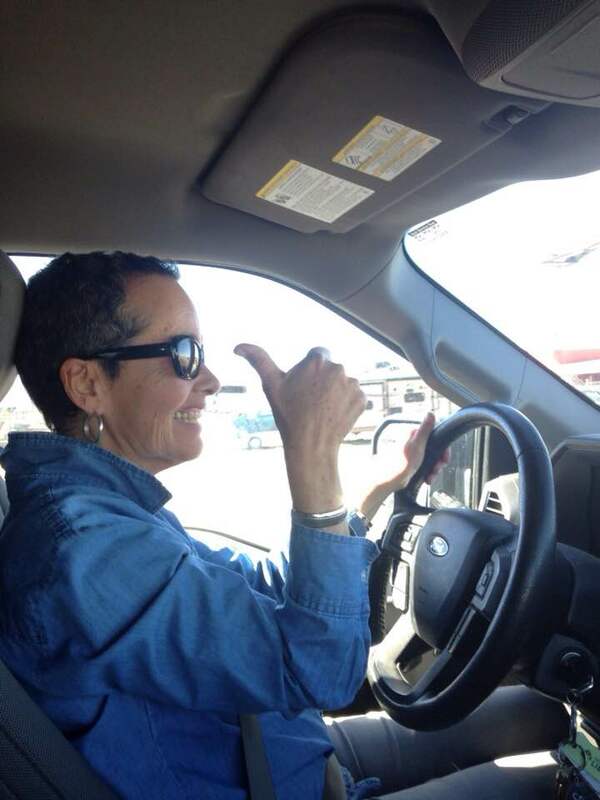 On our way out of Wyoming, I got behind the wheel of our Ford 150 and practiced towing T2. I had done this before on short hauls and country roads but this was the launch on US 26 through Wyoming. Two days of two hours each was really great and my instructor, Pete, said I did fine. One day was vey windy so learning how to handle the trailer under those conditions was really important. Oh, the adventures that await us when we take in some long gazing during our days. Thanks for coming along with us! 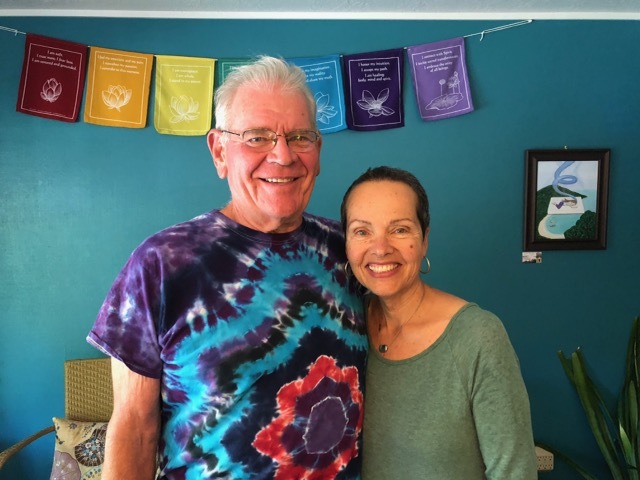 Peter and Liz continue their journey through Nebraska, Iowa and Illinois, visiting some utopian communities in their Airstream, Florida-bound. 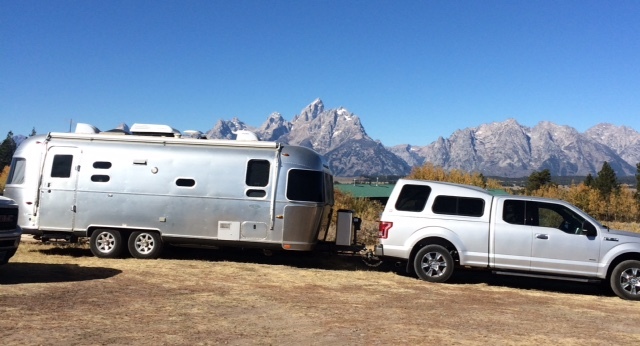 This entry was posted in Uncategorized and tagged Airstream, campendium, Dornan's, Grand Teton National Park, longlonghoneymoon, NOLS, Teton County Library, Yellowstone National Park by lizbrown489. Bookmark the permalink. Such lovely photos and a new pilot at the helm!